Katamari Creator: Gaming's Future Looks "Dull"
The creator of one the strangest videogame series is bored by the ideas of motion control and 3D. 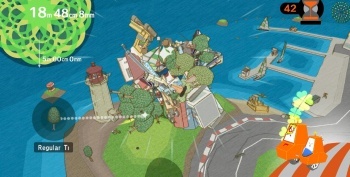 With the new unique gaming trends shown off at E3, including 3D games and motion controllers, you would think the creator of the off-beat Katamari series and Noby Noby Boy Keita Takahashi would have some crazy idea planned for one of them. On the contrary, E3 seems to have turned Takahashi off to making new games completely. "I'm actually not thinking about a future in games," he said in an interview with Official PlayStation Magazine. "It's not that I'm not interested in them, but I want to try lots of different things." In the past, Takahashi has been tasked to develop non-videogame projects such as a playground. He may still be interested in videogames, just not their near future. Takahashi continued to say: "At E3 I saw people putting on speeches but I thought the future seemed a bit dark. The 3D games didn't spark my interest." He also has no interest in technologies like PlayStation Move or Microsoft's Kinect, declaring: "I think motion control's a bit old now, I don't think those games are the future." Overall, Takahashi believes that what was shown at E3 "all seemed a bit dull." I can definitely see where he's coming from, as Move and Kinect could arguably be considered responses to the casual popularity of the Wii rather than technologies developed to advance gaming. I think he's writing off the 3DS too soon, and though he didn't mention it by name, this could be the first negative reaction the product has gotten in the universe. Aside from the 3DS, 3D gaming may be somewhat far off, and motion gaming probably won't change anything until core developers find a use for it, but Takahashi might be a little too negative on the future of the industry, as those new technologies won't create a barrier for the creation of great games.